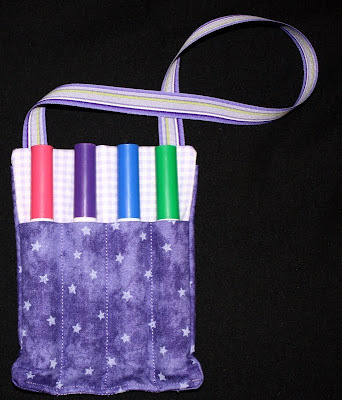 The back side has a pocket to hold a little note pad or stickers or whatever else Chloe wants to tote around. 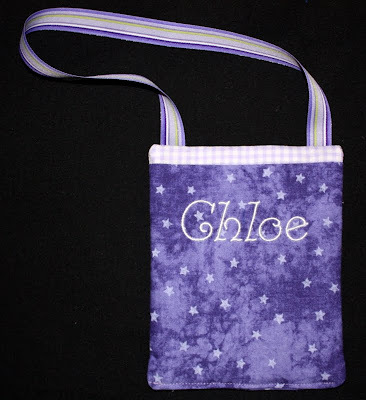 I used the Chez font from 8 Claws and a Paw to stitch her name. 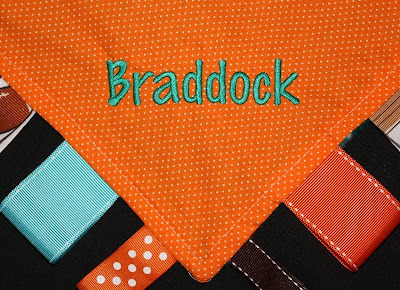 These towels are the next installment of the holiday towels I'm stitching for our moms as part of their Christmas present. 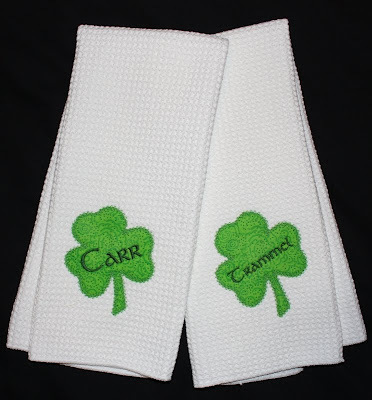 The applique shamrock is from Embroidery Boutique. 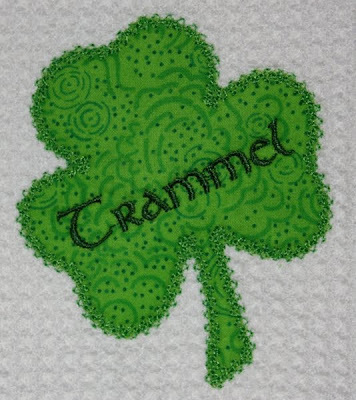 I used Embird Alphabet #37 for their names, thought the Celtic look was appropriate! Michelle requested a couple items for a baby shower gift. 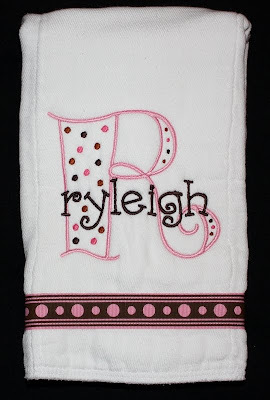 The monogram on the burp cloth is from the Dot Alphabet at Julia's Needle Designs, and I stitched "ryleigh" with Swirley font from 8 Claws and a Paw. 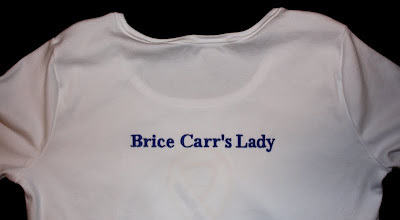 Baby Ryleigh is making Madison a big sister, so she needs a special shirt! 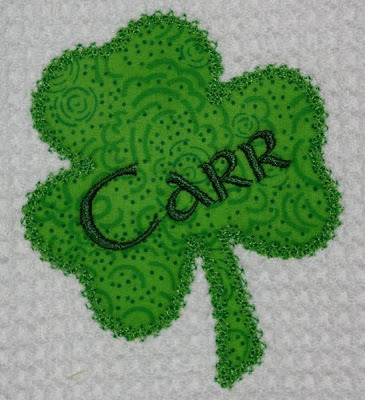 The text came from a free design posted on Sew Forum (no longer available), and the face is "Girl 3" from a design set from Embroidery Library. 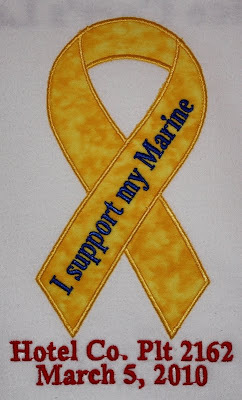 My baby brother (who isn't a baby anymore) is heading into his final week of Marine boot camp. 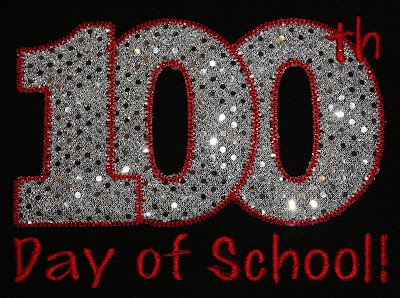 In anticipation of a trip to San Diego for graduation, his girlfriend Tiffany asked me to stitch a shirt for her. 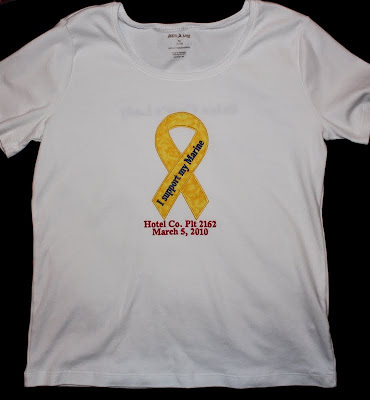 She wanted an awareness ribbon with the text "I support my Marine" as well as his graduation details (platoon and date). 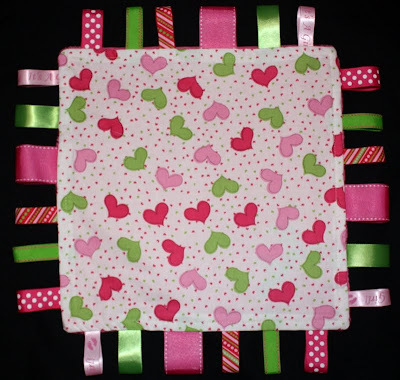 The applique awareness ribbon is a freebie from Embroidery Boutique. I added the text with Embird Alphabet #16. 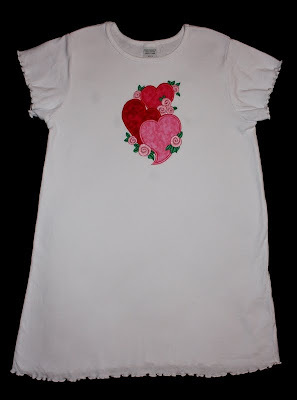 Valerie ordered a couple Short Sleeve Ruffle Dresses from Dharma Trading for me to applique designs on for her girls for spring time. The girls spent some time looking through my blog to come up with ideas, and then we got together to develop a plan. 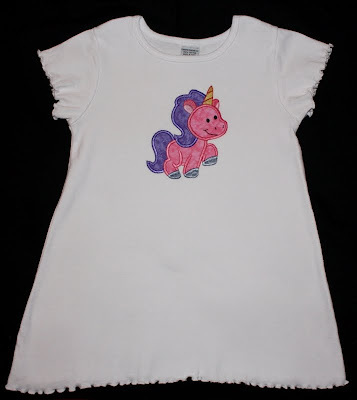 Kenzie knew right away what she wanted -- a unicorn, pink body, purple hair, gold horn. That was easy! 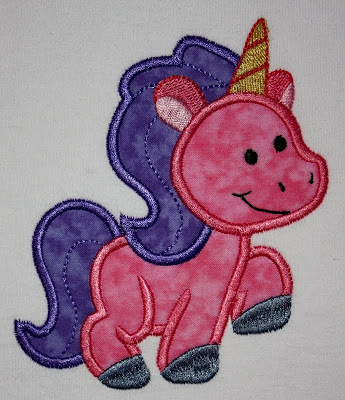 The unicorn is from the Pretty Ponies applique set from Designs by JuJu. 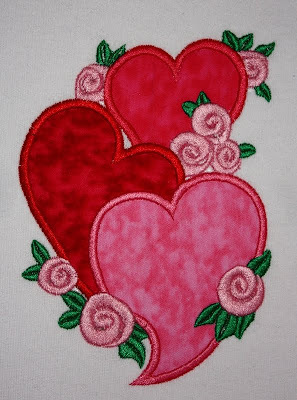 Also from Designs by JuJu, this design is from the Simply Hearts Applique set. She selected these fabrics from my stash of pinks and reds. Christiana (my cousin-in-law, if that's actually a real title) gave birth to a little boy a month ago. 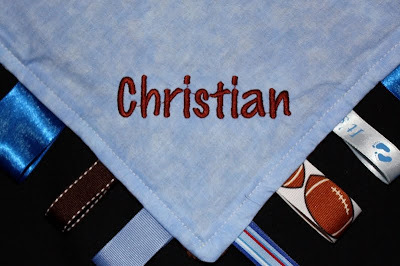 For his burp cloth I used the applique S from Embroidery Boutique's Fun Applique Alphabet. 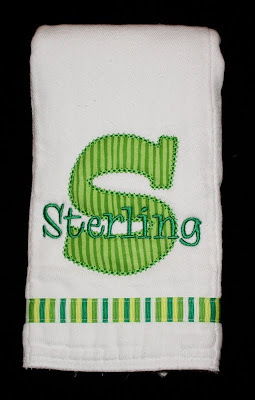 I used the Whoa Nelly font from 8 Claws and a Paw for "Sterling". 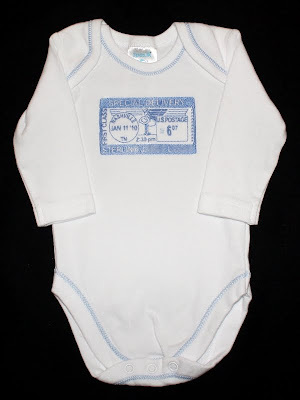 The original design is from Sew Terific Designs; I customized the design with Sterling's birthplace, birth date, time, weight and full name. 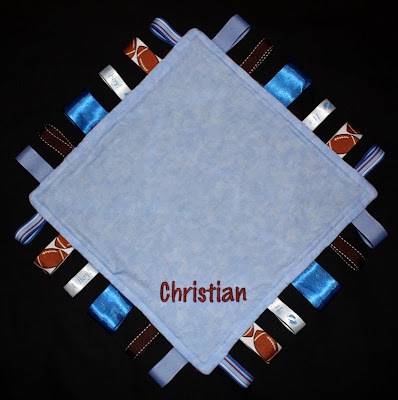 Renee requested ribbon blankets for three little babies that were born recently. 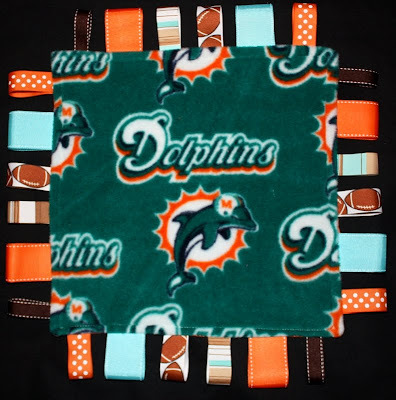 Braddock's family are Miami Dolphins fans, so his has Dolphins fleece on one side and orange pin dot on the other with orange, turquoise and football ribbons. I used Embird alphabet #8 for his name. 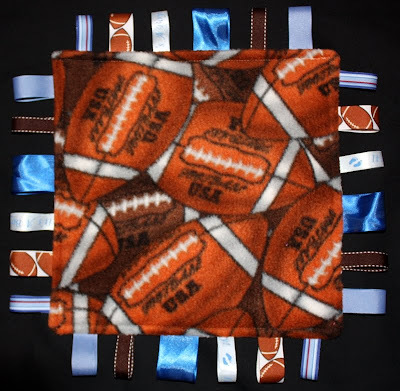 For Christian she requested footballs (used fleece) and baby blue (regular cotton material). I used Embird alphabet #8 for his name also. 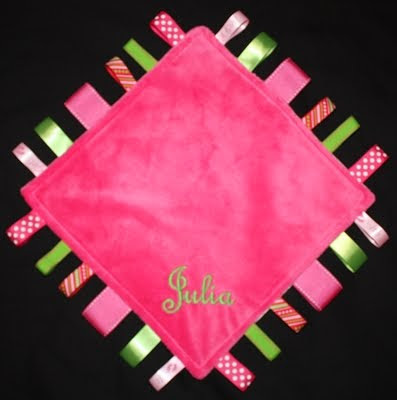 And for Julia's blanket she requested girly pink. :) I used this bright pink minkee for one side and a cute calico for the other. 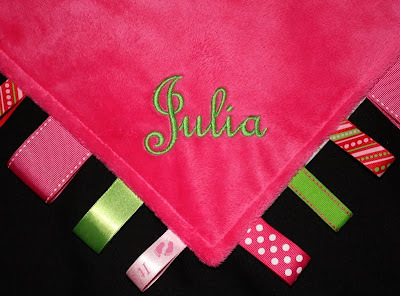 I love the pink and green combo for girls! I used the Frenchie alphabet from 8 Claws and a Paw. 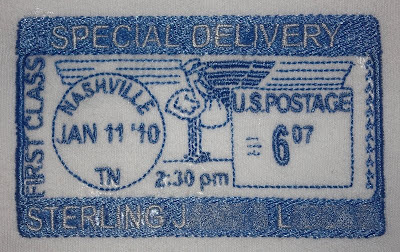 The shirt is the last long-sleeved one I have in my stash from Grandma. 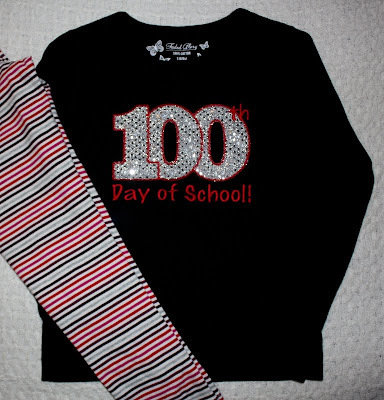 Annaliese just got some new striped leggings, so we picked the silver and red to match. 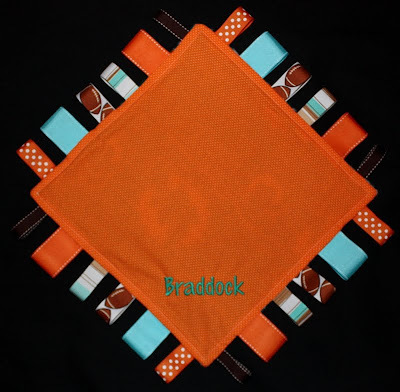 I used Chubby Wubby Applique Numbers from GG Designs, and added the text with Embird Alphabet #8. 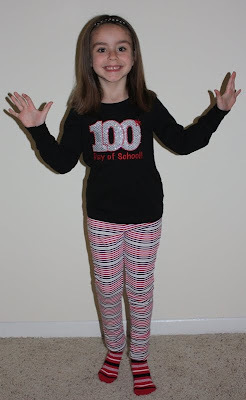 Here's my excited girl, ready to celebrate! Samantha will be getting married this weekend. 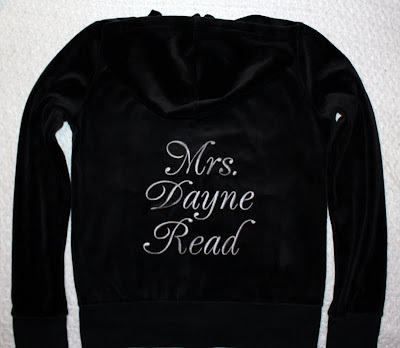 Inspired by a jacket she saw elsewhere, she asked me to stitch "Mrs. Dayne Read" on the back of a velour jacket which she will wear after the wedding. Cute, huh? 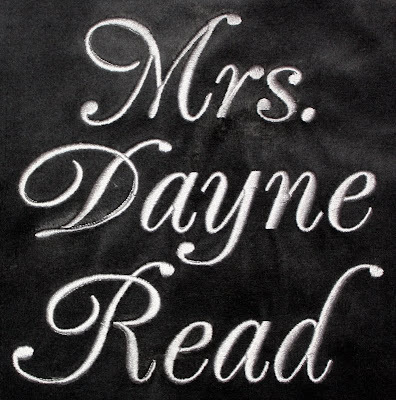 I'm pleased to know that girls these days are still excited and proud to be called Mrs.! Congratulations, and have fun in Hawaii! May God grant you a long and happy life together!